A New York Times Bestseller A National Book Award FinalistAn IndieBound BestsellerThis breathtaking, full-color illustrated fantasy is inspired by Chinese folklore, and is a companion to the Newbery Honor winner Where the Mountain Meets the Moon.Pinmei's gentle, loving grandmother always has the most exciting tales for her granddaughter and the other villagers. However, the peace is shattered one night when soldiers of the Emperor arrive and kidnap the storyteller.Everyone knows that the Emperor wants something called the Luminous Stone That Lights the Night. Determined to have her grandmother returned, Pinmei embarks on a journey to find the Luminous Stone alongside her friend Yishan, a mysterious boy who seems to have his own secrets to hide. Together, the two must face obstacles usually found only in legends to find the Luminous Stone and save Pinmei's grandmother--before it's too late.A fast-paced adventure that is extraordinarily written and beautifully illustrated, When the Sea Turned to Silver is a masterpiece companion novel to Where the Mountain Meets the Moon and Starry River of the Sky. 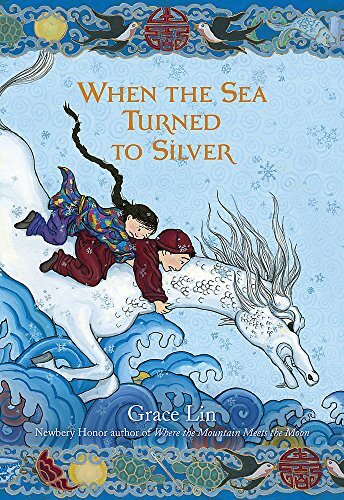 When the Sea Turned to Silver is a captivating story set in ancient China. Pinmei is a gentle young girl living with Amah, her aging grandmother. Amah is known throughout China as the great Storyteller. One devastating night, the emperor’s soldiers kidnap Amah, leaving Pinmei all alone. The only thing that will convince the emperor to release Amah is the Luminous Stone That Lights the Night. Pinmei and her friend Yishan embark on a journey across China to find the Luminous Stone, and their aid comes from an unlikely source -- Amah’s stories. In young Pinmei’s quiet village, her wise grandmother, Amah, is famed for her wonderful stories. Eager listeners are enthralled by Amah’s steady voice and rare ability to bring the rich myths of their Ancient China to life. Stories provide a way to forget about the worrying lack of food and the suspicious new emperor, who raids villages for workers to build an enormous wall around the kingdom. But no story can distract from the sudden abduction of Amah by the emperor himself!